Thanks for your comments, loki007. I am glad that you like the glovebox. Is it possible to purchase these? Or are they only available through the group buy? Please let me know, would love to have one. I would also like to buy one, how do I order one? PM Lotushii He makes/sources them. Are you still interested in one? @LotuShii - Are you still selling the glove box? If so, how do I buy one from you? Did you make the glove box yourself? If so, where did you buy it from? What is the website? If you made it yourself, would you be willing to make another one and sell it to me? 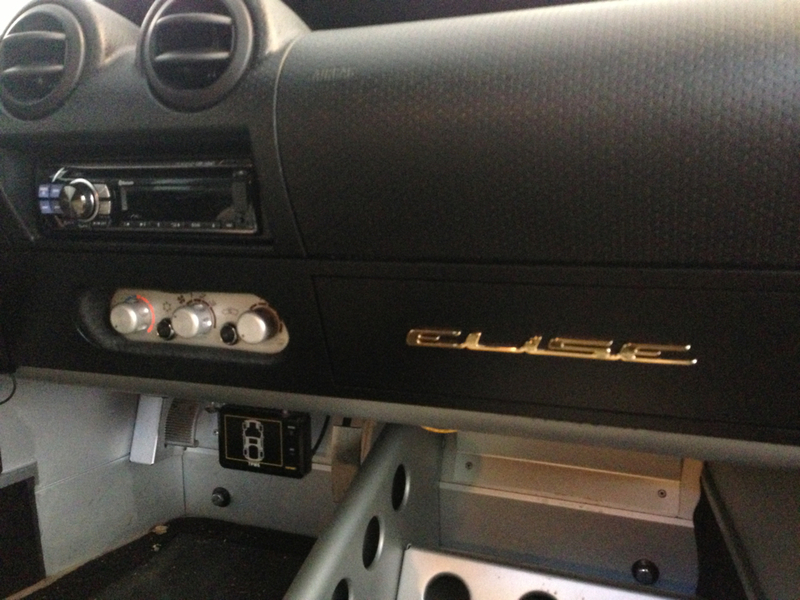 I really want a glove box for the Lotus Elise. Just wanted to chime in with my 2 cents. I was looking for the best solution to turn the stock "shelf" below my dashboard into a real glovebox. After searching the whole web I found Lotushiis custom cover and was convinced. Meanwhile I received it and already installed it - it looks awesome and works fantastically, thanks Lotushii! The whole construction is of superb quality, the hinges and closing mechanism work flawless and it is super easy to install. I covered mine with leather to match my custom interior, but as this cover comes precoated black, it would not be necessary to cover it on a stock Elise or Exige interior. The set included even a separate small part to cover the remaining small area of the stock "shelf" on the opposite side of the steering column. Born_fast, Happy new year! I am glad you like the glovebox. Looking forward to see the pictures! I just bought one off of MConte here on the forum. Nice bit of kit and well made! Question for LotusShii or those who have it? What are the installation instructions? It has the velcro on the reverse and I'm sure I can figure it out (car is in storage so just need to go play with it), but anything specific or lessons learned? Only downside is my car is an '08 and has that 'softtouch' interior that is really more deep charcoal than black. Trying to find something that will match. Crazy as it sounds, Plastidip looks closest. Plastidip is the new duct tape! I would love to buy one of these for my Elise! PM sent. - Can you tell me how you mounted it? I bought mine used from another forum member hence no mount instructions. Car is in storage so can't go look at it, but assuming you just velcro it to the aluminum tray opening? Does it slide into the opening at all? - Where did you get that Elise logo? I might do the same. Kamsden, nice job! It looks great! I like the chrome lettering too! Curiosity got me here.... Has your brake pedal been replaced by a black box, or are my eyes deceiving me?